Well, you and your friend are trapped in the zombieland and now you guys have to fight these dangerous creatures for your lives. The game Zombieland is a great clicking game with simple but addictive gameplay, plus the timing element. Are your ready to enjoy it? First, your friend will throw the balls and you have to use your left click to swing the bat. 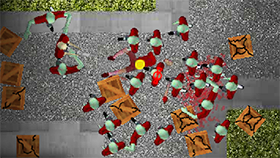 Each zombie has a health bar and you have to kill all these zombies to win the level. After winning a level, you have some skill points and you can drag some special balls into any slot for the next level. Note that base balls hit effectively can do more damage than a dum dum bullet. When you have enough skill points, go upgrade your hitting and throwing combo for faster throwing and harder hitting. Remember: a headshot is great! Good luck and have fun! 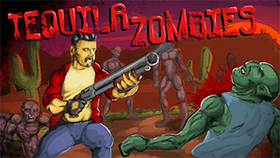 Use your left click to swing the bat, hit the balls and kill these zombies. Wait for the bounce and hit near the dotted line for best results. Hit the ball nearer the sweet spot for the hardest hit. If you want more, go visit the site Freegames66.com and enjoy the awesome unblocked version of Zombieland. 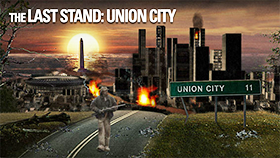 Moreover, you can also explore tons of games like Zombieland Unblocked for free on our site.